I had had a request from a non-sewing mom to make one awhile back; she liked the pattern but it’s not exactly a learn-to-sew project. 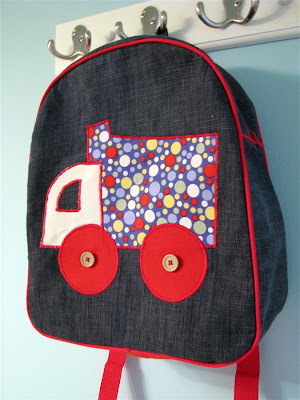 She wanted a dark denim and liked the idea of piping with red (I had red and brown on hand), so I went for a truck applique with some newly-acquired Michael Miller Polka Dots (more projects with that soon!). I wanted to use the fabric I had on hand (for custom stuff especially rather than go out and buy yards of fabric for samples that might then never get used), so I used some denim that had been “mined” from a pair of jeans in the thrift store pile. 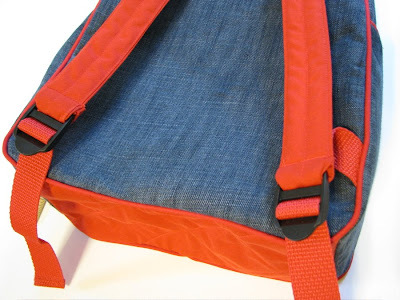 I’ve been saving old pants that are just going to get tossed or donated; I washed them and cut along the side seams and cut off the waistband — for men’s pants especially that’s a TON of great bottom-weight fabric, perfect for making a backpack out of. I interfaced the denim to give it more bulk and serged all the inside seams. The notions needed (you can also use D-rings instead of strap adjusters) for this project are pictured here. In the pic above you can see it with strap adjusters (all are available at your local chain fabric store). I liked the middle one enough that it’s about halfway done already; the other two appliques will probably make it onto t-shirts or bibs. I use fusible web to iron them onto the fabric and then use a very short zig-zag stitch around all the edges. I’ve been sent a ton of great pictures of backpacks lately from those of you who have made backpacks with the pattern — I’d love it if you would put them in the newly-formed photo pool so we can all admire them! Love the backpack! Wonderful work, as always. Oh so cute! !My little guy would be over the moon! The turtle is really cute! I like the dark denim/red truck better. The colors pop a bit more. Great work! You have such talent, and much more patient than me with those zippers and piping. That is one skinkin' cute backpack. And your appliques are great – I wish I could come up with such cute appliques instead of scouring colouring books and the internet. Trucks, trucks, trucks. You know just what little boys like! Super cute. 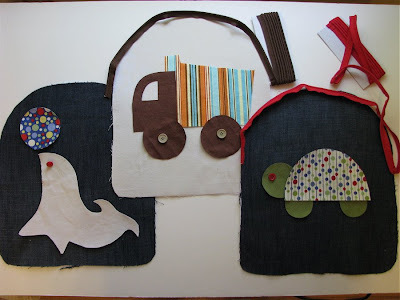 Graet appliques – all of them. I love you used an old pair of jeans. That color of denim is just perfect, especially paired with the red. I am still afraid of piping and zippers – a bit – but I still am working to get over it. This project makes me want to get over it. These backpacks are so adorable. And you work is so neat and professional. I like all the designs! Adorable! 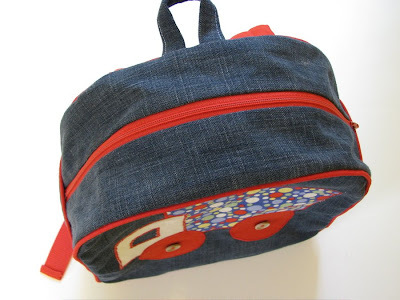 Love the turtle sample too, and (a bit late to the party) your Buttercup bags – so pretty! I LOVE the turtle! If you wanted to finish it, this very novice sewer knows of a good home! OMG! It's so cute! I think my fave is the turtle! Ooooh! I loves it! Also, that seal is A-D-O-R-A-B-L-E-! the denim is totally cute. i still need to finish mine w/ the laminate. . . someday. soon. maybe. as you may have read – i've been doing a lot of notary stuff, so don't think i will get that pattern done in time. i'm sure i could dedicate myself to figuring out all of the computer stuff late at night. . . but. . . oh well. opportunity lost by me to have you try it out! dang! the one in the middle is my favorite, too! very cute! hey-you're tutorials inspired me to try my own…it's very simple, too simple of a project to need a tut, but I just had to try! i posted it today(tuesday), if you get a chance to stop by! Yes, a license for selling the backpack is on "My List" so I will be sure to post as soon as it's ready! I recently found your blog and you are amazing! Thanks for sharing your talents and creations with everyone. The blogging world is a wonderful place!